The Justice League moves in on Deathstroke. He’s killed the Fan, adding to the already tense situation in East Africa. Unfortunately, he seems to understand what’s going on better than the League. 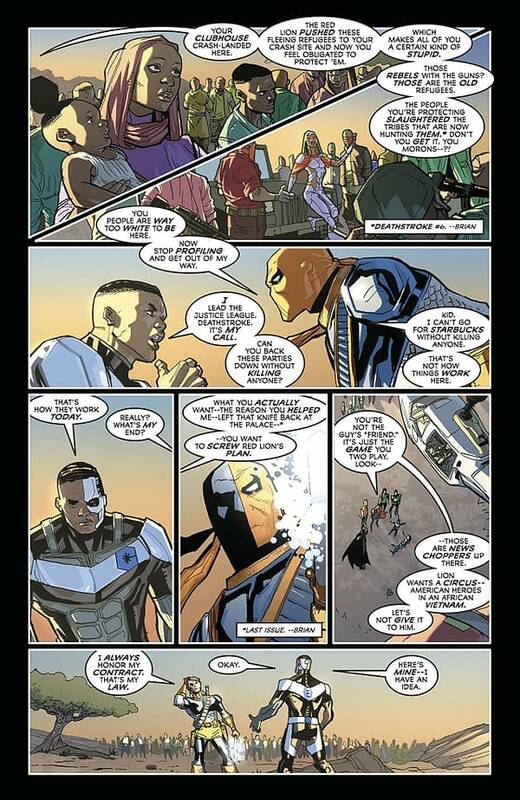 However, Slade and Cyborg come to an agreement that may just resolve this whole mess. Elsewhere, Flash and Kid Flash take the wounded Wonder Woman to Raven in the hopes that she can save the Amazon. After the absolute insanity that was ‘The People v. the Justice League’ and ‘Justice Lost’, I’m not sure how I expected Christopher Priest’s run on Justice League to end. What could be the most satisfying ending to an arc like this, especially when we know that the League isn’t going to die or disband? Is there a satisfying ending to be had? While I refuse to believe that there is no such thing as a “satisfying” or “fitting” ending to this story, this wasn’t the best one possible. That doesn’t make it bad; it’s not bad at all. Its biggest flaw is ending it predictable; it gives us the finale with a moral we already deduced from the previous 10 issues: the world is complicated, and the League may not be suited to solve all its troubles. It does have its more unexpected and enjoyable moments. Cyborg receiving some validation as a leader and later decking Batman is great. Technically breaking up both JL teams before the No Justice-teasing is something of a consolation prize to this story. Pete Woods’s art finishes the run out on a strong note. The energy, vibrancy, and distinctive style that has typified his art in this book. The characters look cartoonish but are detailed and expressive enough to carry this book. Thanatos is given an awesome style for his brief cameo. 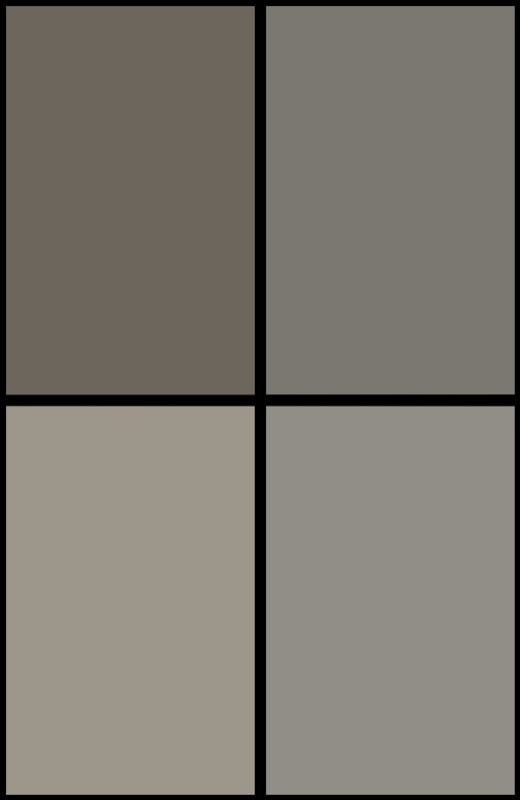 The colors are bright but are well contrasted. Woods makes this a great-looking book. Justice League #43 gives ‘No Justice’ the ending it called for but not necessarily deserved. 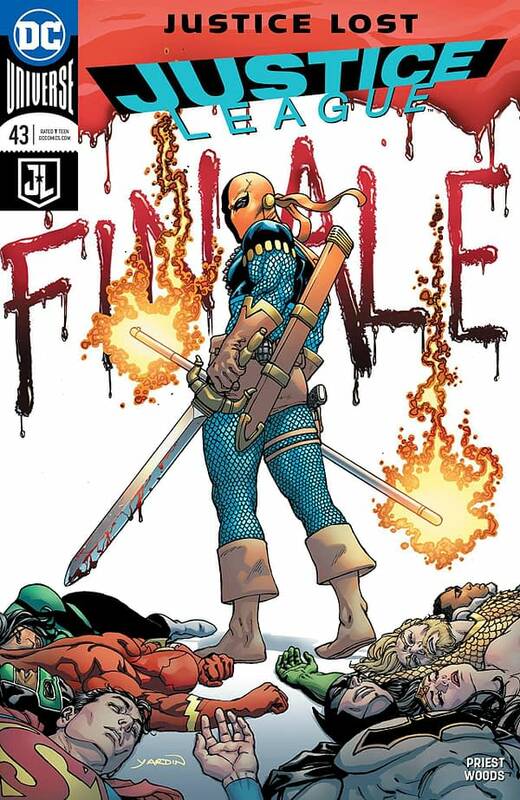 It is a solid read, and Deathstroke verbally and even physically wringing out the League is fun. Woods does some good work on the art once more, and I can still recommend this book. Check it out.